Black and white portrait of brown mare, pacer Signal Rule posing in the backstretch of the Cumberland County Fair Trotting Park, Gorham, Maine, driver Patterson up. 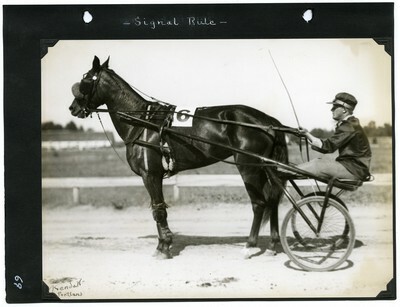 Signal Rule finished third in the 2.21 Pace Stake at the Western Maine Agricultural Exposition, August 1934. The photo is signed in the lower left corner by the photographer Guy Kendall.